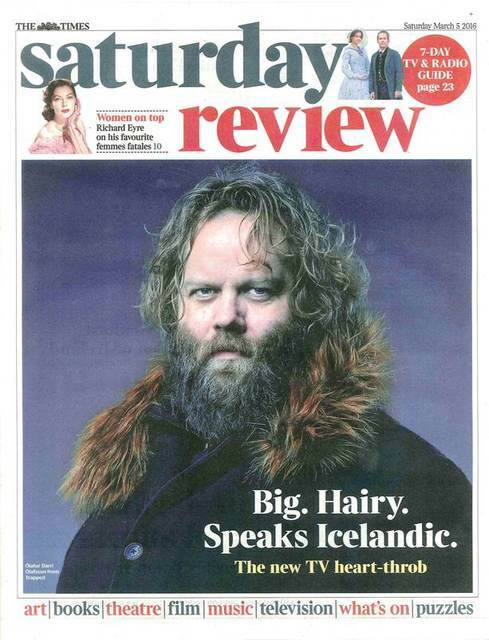 Icelandic actor Ólafur Darri Ólafsson, star of television drama series Trapped is on the front page of the Saturday Review of The Times today. The front page caption reads, "Big. Hairy. Speaks Icelandic." "This is the first and the last time I take a celebrity up to the Timesnewsroom to do an interview. The Icelandic star of Trapped, Ólafur Darri Ólafsson, may think he is safe from his new British fans up on our eleventh floor, but in no time he finds himself snowed in by an avalanche of hardened sub-editors, weary commissioners, cynical critics and blasé interviewers, each wanting to tell him how great he is in BBC Four’s latest, maybe even greatest, Nordic crime sensation," writes the journalist who adds that all his collegues constantly came up to Ólafsson telling him how great his Trapped performance was.